Councils are being called on to clear up confusion around bus lanes - after it emerged that a whopping 888,760 fines were handed out to drivers in 2017. A freedom of information investigation by Confused.com has discovered that Scotland has the highest number of drivers fined for flouting bus lane rules - with 108,735 fines handed out to drivers in Glasgow last year alone. However, the most profitable bus lane is in Oxford with a camera on the bustling high street raking in close to £1.5 million in fines in 2017. A typical penalty charge notice (PCN) for driving in a bus lane is £60, reduced to £30 if paid within 14 days. This money goes straight to the local council and is usually spent on local transport projects. While car drivers are banned from some bus lanes 24 hours a day, others only apply during certain times. These are indicated below the signs for the bus lanes. However, Confused.com claims that these rules need to be made clearer. “Drivers needs to be listened to for a change – it’s only right that some of this fine money is invested to make bus lanes and signage clearer." 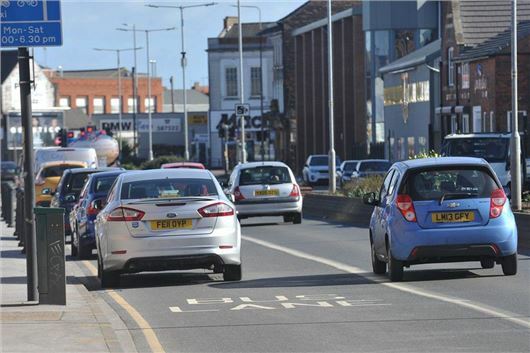 “The £41 million in fines issued by councils are testimony to the fact that bus lanes are one of the most confusing challenges motorists face on our already chaotic roads," said the website's motoring editor, Amanda Stretton. Confused.com surveyed 2000 motorists and found that 48 per cent of drivers had unknowingly driven in a bus lane, while more than a quarter (28 per cent) admitted to doing so in a bid to beat traffic. What is a PCN, and what should I do if I receive one? Drivers can be handed a PCN (penalty charge notice) if they commit a traffic offence such as parking on double yellow lines or driving in a bus lane. These are sent to the car's registered keeper and, as they're civil matters rather than criminal offences, they're dealt with by a fine. Drivers can reduce the financial impact of the PCN by paying the fine as soon as possible - they usually double if they're not paid within two weeks, and it then escalates if it's not paid with 28 days. To contest a PCN, you must do so within 28 days. When you open an appeal, the fine will freeze until it's resolved. To open an appeal, most councils require a formal representation in writing - there'll be instructions on how to do this on the PCN itself. If the appeal is rejected, it can be advanced to the independent Traffic Penalty Tribunal. This service allows drivers to open a case online and is the final stage of the appeal process. Drivers who simply refuse to pay risk court action and bailiffs being sent to their home to recover costs. This is an example of councils taking away driving space from ordinary motorists, then profiting from the confusion they cause. Permanent bus/tax/cycle lanes need to be coloured differently to this avoid confusion. Additional conventional signage is a road safety issue as drivers are finding it harder, and harder to read all the information thrown at them whilst trying to drive safely. All this sneaky, unforgiving technology fining people just to make money rather than constructively improve people's driving or consider mitigating circumstances, yet nothing is done about the legions of 'immune' criminals driving around with false number plates. Don't you just love motoring in our lovely modern society? I have had cars go past me using the bus lane, probably because i was obeying the speed limit. Judging by the way they dived into the lane, passed me and then returned to the non-bus lane i think they knew precisely what they were doing. Exactly - and I wonder how many of those people doing that kind of thing know they can get away with it because they are using false number plates cloned from another similar vehicle? Another great thing these people do is where a bus lane ends just before a traffic light junction or roundabout - so you do the right thing by following the lane until where the bus lane ends with your indicator on, but the bad driver behind joins the bus lane a few metres short of it ending, then undertakes and holds you out from joining the lane you need to be in to turn left at the junction! Then no-one lets you back in and people behind in the lane you're now stuck in start honking their horn at you as if you've done something wrong! Some road layout designs just seem to encourage accidents, bad driving and/or road rage, especially when they don't even consider what methods bad drivers and criminals will use to bypass the controls in place. I couldn't agree more, well said sir. Yep I got caught by one. I turned left out of a side road onto a 2 lane one-way road. The left lane then became a bus lane almost immediately but I couldn't get across as the right lane was full of stationary traffic (because there was only 1 lane for all the cars to use). I guess I should have just slammed my brakes on and stopped in the middle of the road to wait for a gap. I went back after I got the PCN and there was 1 small sign at the junction before I turned left but as I was looking to the right to see if the road was clear for me to pull out I missed it. I reckon they must make a fortune from that junction. I was fined by the spivs,ex market barrow boys and ex ticket touts who now infest the caouncils of London. Heading North in the infestation referred to as Camden I found myself in very slow moving traffic. After some fifteen minutes of this the cause became obvious - a car had broken down and the following traffic was slowly passing on the inside. The inside was a bus lane. A week later, true to form, the money grabbing Camden Council sent me a letter informing me (and obviously many hundreds more drivers) that I must pay a £80 fine. I telephoned the extortion department of Camden Council and pointed out that if people had not passed on the inside then in a matter of minutes the tailback towards central London would have caused a massive grid lock throughout the area. The response was that "it doesn't matter, you never ever enter a bus lane". So London councils are not just infected by the spiv, barrow boy and ticket tout mentality but also by people with a mental ability and level of common sense bordering on below sub-normal. Have a nice day NOT. As previously suggested, bus lanes should be surfaced in a different colour. This would hopefully remove the confusion of we ordinary motorists, but also the frequent accusation of councils using our accidental infringement of the restrictions as yet more'cash cow' income. I have personally been aware of 'bus lanes' being created in quite ridiculous situations, such that they can't be of advantage to buses yet are of handy advantage to councils for their 'fine & pocket' policy. In the same vein, cycle lanes should also be surfaced in a different colour - many is the time that markings in the road have worn away, causing yet more confusion to we motorists who do our best to be law-abiding & to make the roads safer for all users. I would have a great deal more to say about cyclists & their behaviour but perhaps now is not the place!! Incidentally, on a holiday to Turkey I really had to smile when I noticed a tractor lane. We could introduce that here & the motorist would have nowhere to go! Saving on the emission problems, it would however remove the vast amount that motorists provide to the Government. So taxes up for all. Bit of a dilemma ?! I agree with Micky Myers and 999pez regarding their comments on bus lane signage. Very early September this year I went into Glasgow at 11 p.m. to recce my route for the following morning. Glasgow had changed the road directions since my last visit 20 years previous and added lots of bus lanes. I was ‘caught’ twice travelling along a road that had added these specialised lanes which I was unaware of AND failed to have illuminated lighting displaying warning/indication of that exclusivity. Consequently, within 7 minutes my 2 transgressions had been photographed. Unaware of my predicament I was away from home when the penalty notices arrived so did not make the reduced penalty time period, which put the cost up to £60 for each. What added to my ire was that the next day I was caught in 1 of the fined areas, not because of the darkness as the previous night, but letting myself get flustered by traffic flow and inability to clearly see the road signage, which I subsequently found out that it was beyond traffic route signage which had my attention. All 3 penalty notices arrived at the same time - when I was not at home. RESULT - £180 fine. No compassion given when asked for. Sorry Glasgow I don’t like your welcome!! I was taking an American visitor to Woverhampton Railway Station, having been given a verbal route description. As I had little idea of the route, I was watching road signs and other traffic and had driven into a bus lane without knowing that I had done so. I was sent photographs showing my car leaving one lane and entering another and it was not clear which of the two was a bus lane. I explained the circumstances, pointing out that this was my first excursion into the centre of Wolverhampton. The fine was more important than a sensible view of the circumstances and my mitigation was dismissed, with the statement that there were signs indicating the route to the station. These were new signs to the new station which was not yet in use. My appeal to the Independent Adjudicator was not opposed by the council and my fine was repaid. Shortly afterwards I read that the Government were to urge councils not to fine first offenders. A school from past years had only one rule; Use common sense. Lots of comments here straight out of the Daily Mail book of complaining! How about taking responsibility for your own actions? If you think the markings on the bus lane in question were insufficient then defend yourself properly using the council complaints procedure. Otherwise, just admit you made a mistake and pay up.